Placement of removable prosthesis in the oral cavity produces profound changes of the oral environment that may have an adverse effect on the integrity of the oral tissues. Soft tissues of the mouth play an important role in the successful use of dentures. Most soft-tissue problems arise from previous ill-fitting or ill-maintained dentures. The wearing of an ill-fitting denture for a long time causes repeated irritation to the mucosa during chewing, and consequently, fibrous growth of the tissue will occur as a defense response. Many dentures fail because the impression is made when tissues are distorted by the old denture. Soft tissues displaced during conventional impression making tend to recoil and denture made from such impression lack proper retention, support, and stability. Flabby ridge is actually replacement of alveolar bone by fibrous tissue with poor denture supporting properties most commonly in anterior maxilla (as result of combination syndrome) due to excessive load of the residual ridge. Excision and removal of mobile tissue from the ridge crest are frequently performed, and this often results in sharp bony ridge protruding from under a firm but thin soft-tissue covering, which is undesirable. Such tissues need to be recorded and maintained in undistorted form. This case report describes management of flabby tissue in the maxillary anterior ridge with a complete denture using special procedures. A 52-year-old female patient reported to the Department of Prosthodontics, Baba Jaswant Singh Dental College, with a chief complaint of loose dentures. She was edentulous for the past 3 years and wearing ill-fitting complete denture for the past 2 years. Medical history revealed that she was diabetic for the past 10 years and was on medication for the same. Intraoral examination revealed flabby tissue from lateral incisor to lateral incisor in maxillary ridge [Figure 1]. Various treatment options such as surgical excision of the flabby tissue and implant-supported overdenture were explained to the patient, but the patient was not willing for the same. Hence, it was decided to fabricate liquid-supported denture for the maxillary arch and conventional mandibular denture. The patient was asked to discontinue the present denture and recalled after a week. 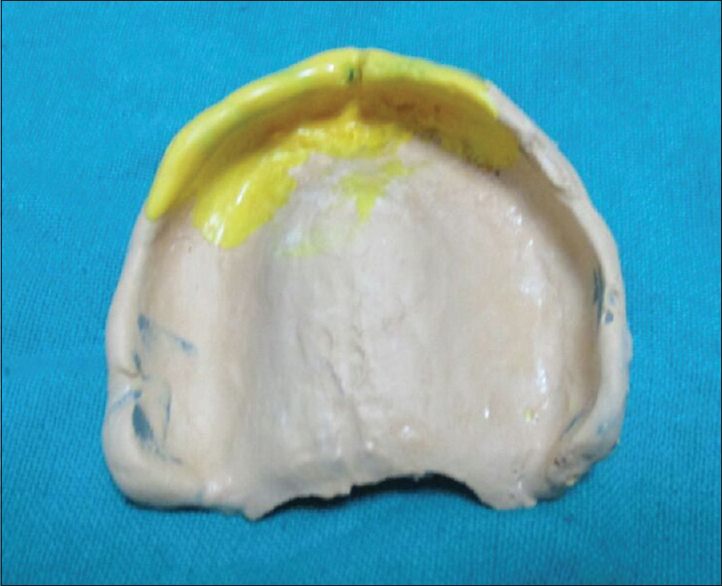 Primary impression of the maxillary ridge was made with low-viscosity irreversible hydrocolloid material to avoid distortion of the displaceable tissue, and lower impression was made with impression compound. Impressions were poured in dental stone to get the primary casts. Custom tray with spacer was fabricated. Border molding was done, spacer was removed, and final impression was made with zinc oxide eugenol (ZOE) paste. A window was cut in the flabby tissue area of the maxillary custom tray. 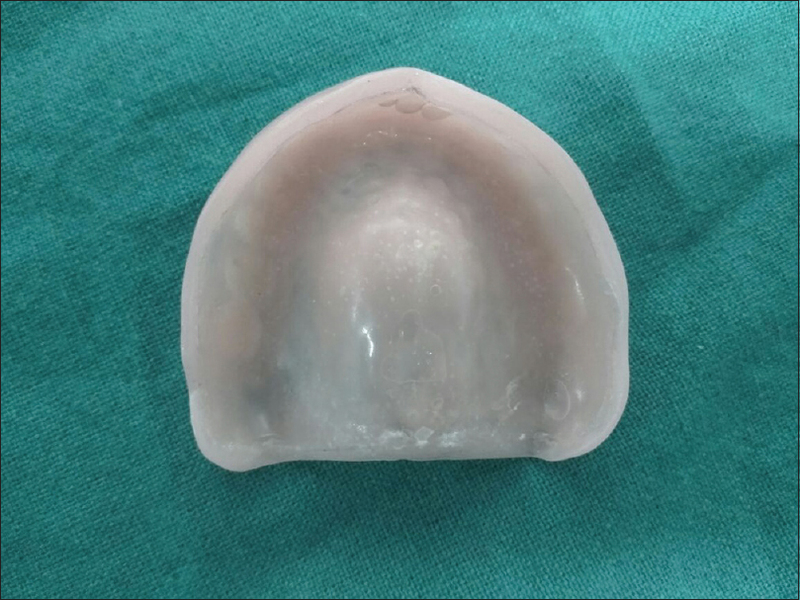 Impression was reseated in patient's mouth and light-body addition silicone material was injected over the flabby tissue. After complete setting of the material, impression was removed and inspected [Figure 2]. Conventional procedures, jaw relations, trial, wax-up, flasking, and dewaxing were followed. At the stage of packing, 1-mm thick vacuum heat-pressed polyethylene sheet was adapted over the master cast with vacuum forming machine and kept 2-mm short of the sulcus [Figure 3]. Vaseline was applied over the sheet, and normal packing and curing procedures were done. Denture was retrieved, finished, and polished in usual manner and delivered to the patient. She was asked to use it and recalled after 1 week. 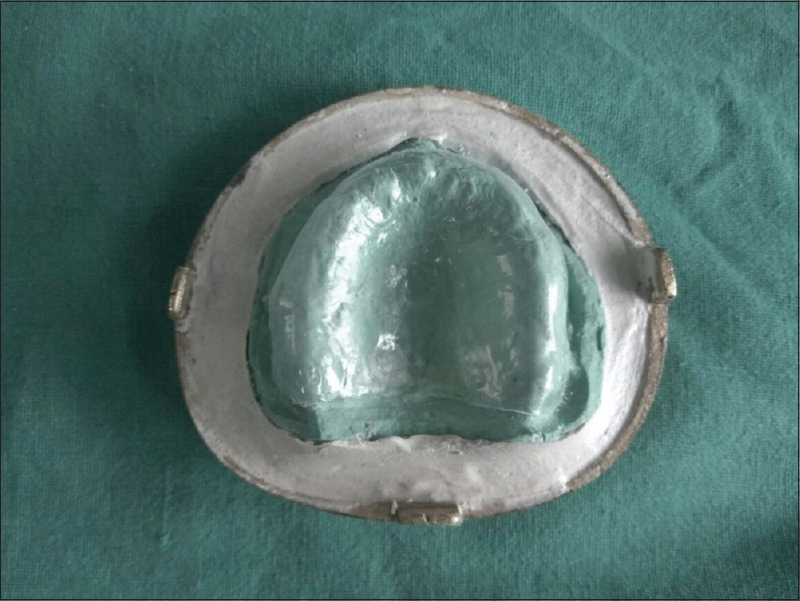 Impression of the tissue side of the maxillary denture was made with putty material and cast was obtained. A 0.5-mm thick polyethylene sheet was adapted on this cast and kept to the junction of acrylic and soft sheet. A 1-mm sheet was removed from the denture [Figure 4] and was replaced with this 0.5-mm thickness sheet to create 0.5-mm space between sheet and the acrylic for the liquid. Junction of the sheet was carefully sealed. Glycerin was injected into this space through two holes created on the distobuccal region, and holes were sealed later on with acrylic. Denture was examined carefully for any leakage and delivered to the patient [Figure 5]. The performance of a complete denture is often of a reflection of its support and retention. Most dentures fail because of inadequacies of diagnosis and treatment planning or because basic principles of fabrication are ignored. The vast majority of the patients for whom complete denture therapy is prescribed have already been using dentures and frequently show adverse supporting tissue changes. Flabby ridge is a superficial area of mobile soft-tissue affecting maxillary or mandibular ridges, which develop when hyperplastic soft tissue replaces alveolar bone. When found in the anterior portion of the maxilla, it is usually the result of anterior hyperocclusion as in combination syndrome. These areas of mobile tissue provide limited support for the complete denture. The patient's health, willingness, extent of flabby tissue, and financial status determine treatment planning. Considering all these factors, surgical and implant overdenture options were not chosen and liquid denture option was finalized. There is a need for the impression technique which will compress the nonflabby tissue to get optimal support without displacing flabby tissues. Various impression techniques have been used in the past to record mobile tissue in undistorted form. Liddelow  technique uses two different impression materials in a custom tray. Plaster of Paris is used to record impression of flabby tissue and ZOE for normal tissues. Osborne  used two impression trays and materials to record flabby and normal tissue separately and then related intraorally. Window technique used here was introduced by Watson  to record flabby tissue using minimum pressure ensuring minimal distortion of the displaceable tissues. Low-viscosity material ensures minimal displacement of the tissues. 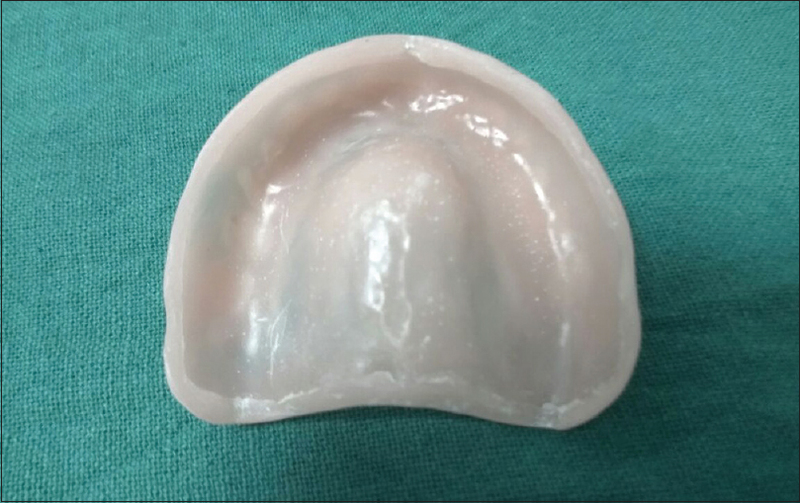 This impression technique records flabby tissue without any distortion, and the whole procedure does not involve any extra visit of the patient as compared to conventional complete denture procedure. Materials used in this case are readily available and commonly used in the clinics. DeVan  stated that “the preservation of that which remains is of utmost importance and not the meticulous replacement of that which has been lost.” Fibrous tissue, however, has a cushioning effect which reduces trauma to the underlying bone so better avoids removal. The patient could not afford implants, so implant-supported overdenture option was not chosen. The best treatment option left was liquid-supported denture which does not involve any surgical procedure. An ideal denture base would continuously adapt to the mucosa and thus should be flexible. However, it also has to support the teeth during function and thus should be rigid. Liquid-supported dentures combine both the features. Various materials including tissue conditioners and soft liners have been used in the past for flabby ridges but proved to be temporary alternatives only as they are prone to candidal growth with time so frequently needs to be changed. Liquid-supported dentures offer optimal distribution of forces and hence preservation of residual ridge, better retention, stability and support, prevention of chronic soreness from rigid denture bases, comfort to the patient with flexible surfaces, and improved patient tolerance. Glycerin used is nontoxic, odorless, cheap, and biocompatible and has good thermal stability and low surface tension. Liquid dentures thus provide benefits of soft liners and tissue conditioners on long-term basis. Although liquid-supported denture is more voluminous and more ponderous than a conventional denture, this does not influence speech or comfort. 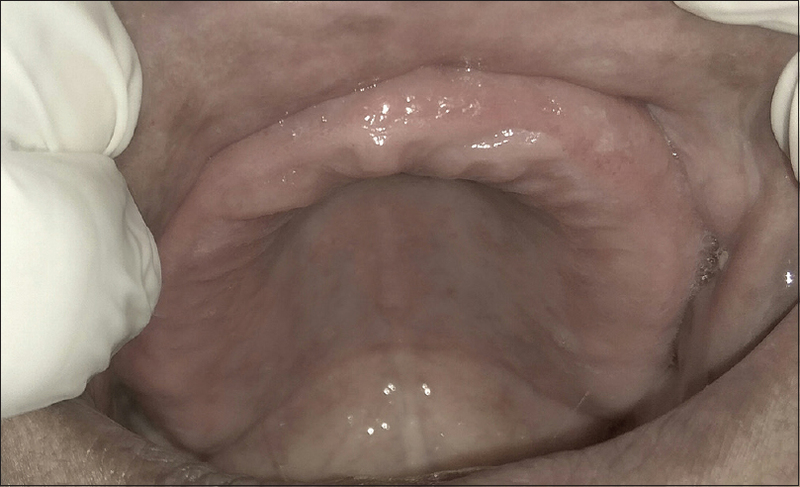 This case report described management of flabby tissue in maxillary anterior ridge area with a liquid-supported denture and using window impression technique. Considering patient's health, willingness for surgical procedures, financial status, and extent of mobile tissue, liquid-supported denture option was chosen. Such denture design incorporated both plastic and elastic properties and acts as continuous reline for the denture. Zarb GA, Bolender CL. Prosthodontic Treatment for Edentulous Patients: Complete Dentures and Implant Supported Prosthesis. 12th ed. Louis Missouri: Elsevier, Mosby; 2003. p. 34. Hayakawa I. Principles and Practices of Complete Dentures – Creating the Mental Image of a Denture. 1st ed. USA: Quintessence Publishing Co. Ltd.; 1999. p. 13. Heartwell CM, Rahn AO. Syllabus of Complete Dentures. 4th ed. Varghese Publishing House: Bombay; 1992. p. 58. Fenlon MR, Sherriff M, Walter JD. Comparison of patients' appreciation of 500 complete dentures and clinical assessment of quality. Eur J Prosthodont Restor Dent 1999;7:11-4. Chase WW. Tissue conditioning utilizing dynamic adaptive stress. JPD 1961;11:804-15. Winkler S. Essentials of Complete Denture Prosthodontics. 3rd ed. AITBS Publishers: India; 2015. p. 87. Liddelow KP. The prosthetic treatment of the elderly. Br Dent J 1964;117:307-15. Osborne J. Two impression methods for mobile fibrous ridges. Br Dent J 1964;117:392-4. DeVan M. The nature of the partial denture foundation: Suggestions for its preservation. J Prosthet Dent 1952;2:210-8. Davidson CL, Boere G. Liquid supported dentures. Part II: Theoratical and technical considerations. J Prosthet Dent 1990;63:303-6. Dammani B, Shingote S, Athavale S, Kakade D. Liquid supported dentures: A viable option for atrophic edentulous ridges. J Indian Prosthodont Soc 2007;7:35-9. Boere G, de Koomen H, Davidson CL. Liquid-supported dentures. Part II: Clinical study, a preliminary report. J Prosthet Dent 1990;63:434-6.